This item is sold out: all pre-orders will ship in early July 2018. The first 250 copies of the London After Midnight 1927 Ultimate Guide are signed by the authors and come with a FREE art print! The London After Midnight Ultimate Guide evokes the atmosphere in the brochure you might have bought at the cinema in 1927! 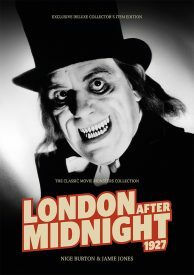 One of horror cinema’s most coveted lost films, 1927’s London After Midnight is shrouded in mystery. Lon Chaney’s portrayal of Inspector Burke and his saw-toothed alter ego showed the Man of a Thousand Faces at his eerie best, and the production’s rich atmosphere has become the stuff of legend. Our beautiful full colour magazine guide to London After Midnight takes a wide-eyed, hypnotic look at the people involved in the movie, as well as its production, its story – and its disappearance. 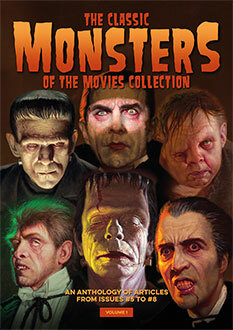 From the film itself, to star Chaney, director Tod Browning and the many other talented artists who brought the picture to the screen, this richly illustrated publication is packed with beautiful stills, posters and imagery as well as a wealth of information, biographies and trivia, including details taken from the movie’s original shooting script. What happened to Roger Balfour? Who is the man in the beaver hat? It’s time to brush aside the cobwebs and explore a unique piece of movie history, with our Ultimate Guide to London After Midnight showing the way into the darkness. Remember, the first 250 copies of the London After Midnight Ultimate Guide are signed by the authors and come with a FREE art print, so place your order today! Or, if you fancy something really exclusive, why not take a look at the hardback version, limited to just 25 copies worldwide.